The fastest, smartest path to competency based Talent Management. Your people are your number one asset. Their skills and knowledge are their number one asset. Are you capturing your assets as well as you can? Skills DB Pro the easiest way to understand the skills your business has and the skills you need to develop. Skills DB Pro software will help you to assess and leverage your employees’ greatest assets, their skills and competencies. Review critical competency gaps and the capability of your organisation. Identify subject matter experts, mentors and assign the right people to the right projects. Identify learning needs accurately, prioritize critical areas of development at an individual, team or organisational level. Develop career paths and invest smartly in your workforce to improve learning and boost retention. Finally get an ROI on your training program. Track employee skill improvements over time. Use intelligent insights to optimize your workforce, projects, succession planning, and training needs. Skills DB Pro has intuitive drag & drop reports as well as OLAP data analytics to help you quickly identify areas of strength and skill gaps quickly and accurately. In only 8 minutes you will see the best way to manage the competencies of your people. Have an IT Department or are an IT Company? Check out our IT Competency Skill Builder! How can Skills DB Pro help your company? Watch this video and learn how. Get your Free 1 on 1 live demo. We will show you how skills management fits into your organization. So much promise, so many overpriced tools. 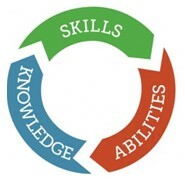 Skills tracker solutions. So much promise, so many overpriced tools. You’ve scoured the internet for something designed for you, software that allows you to manage your people’s skills and put the right person, in the right place, at exactly the right time. The question is: why are the tools in this space so ridiculously expensive and, adding insult to injury, so hard to use? Maybe you’ve tried one of the big talent management players and you’re exhausted with their clunky UI or lack of new features. Or maybe you’ve outgrown your excel spreadsheets and find yourself adding hack after hack to try to keep up with your skills management needs. At your stage, word documents, excel sheets, and paper resume’s just aren’t cutting it anymore. You’re hearing everywhere that skills management automation is a place to make big leaps in employee productivity; from skills inventory to training needs analysis, to competency management, to performance reviews and employee retention. But the solutions you’ve looked at have been too complicated, time consuming, and expensive to set up. If that’s the case, you’re going to love Skills DB Pro. Skills DB Pro provides the answers you need. In Skills DB Pro your data is easy to search and analyze, giving you insights to your most common and troublesome questions. With the Employee Search functionality of Skills DB Pro, answering this question is as simple as filling out your criteria and hitting ‘Find’. Is our focus and investment in skills training aligned with our business goals and objectives? By tracking your employee skills, you can tie them back to their individual development plans and competency profiles, to see the trending outcomes of your training programs. Using the Skills Audit / Gap Analysis reporting features you can get a count of how many employees possess a particular skill or certification. Then easily drill down and view detailed gap analysis reports by employee. How can I create a Skills Matrix? Skills DB Pro has standard Skills Matrix reports built for you. Also, with easy-to-use drag-and-drop report filtering, getting the exact data you need is simple. Employee evaluations are coming up, how can I discuss employee skill levels objectively? Skills DB Pro allows employees to rate themselves, and managers to rate their employees, showing you congruence’s and discrepancies in how each employee and manager views the employee’s competency levels. What skills do I need to be successful in my current and or future job? Career development can be nebulous. By, using the goal management module, employees know exactly what skills they need, by job title, giving them a road map for success. 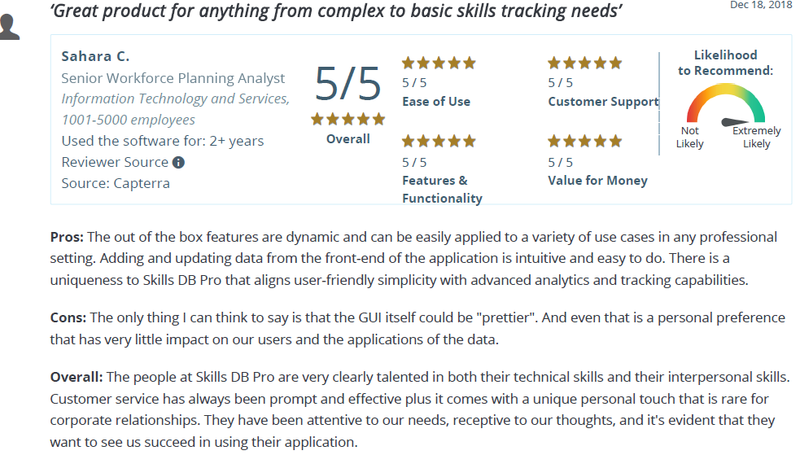 From training needs analysis, to project placement, to employee reviews, Skills DB Pro is the refreshingly simple skills tracker. No more spreadsheets, sticky notes, and emails about who has what skills, just one uncomplicated, central hub. Who else uses Skills DB Pro? From small consulting firms, to mid-sized companies, to enormous multinationals, Skills DB Pro is the go-to skills management tool for hundreds of thousands of employees world-wide. Click here for a partial client list.